On July 19, Bourse & Bazaar held a round table in Tokyo, part of a global series of meetings being held in advance of the 4th Europe-Iran Forum. This event, hosted by the JIME Center of the Institute for Energy Economics, Japan’s leading Middle East research institute, brought together senior executives from some of the largest Japanese companies to discuss their progress and frustrations in the Iranian market. Since Implementation Day, Japan has been slowly increasing its economic activity in Iran. Japan has committed to establishing a financing facility worth USD 10 billion to support new investments in Iran by Japanese companies, which have begun to sign new investment contracts across several sectors. Most recently, Toyo Engineering Corporation signed an agreement with Iran’s National Iranian Oil Company to rehabilitate Iran’s Salman oil and gas field in partnership with domestic oil firm Petropars. However, the pace of post-sanctions trade and investment has lagged behind expectations. Japan was among Iran’s most established trading partners prior to the tightening of international sanctions, and Japanese multinationals have longstanding partnerships in the country. But the rush of activity from European and Korean multinationals has seemingly left the Japanese behind. Japanese executives are asking: “How are the Europeans doing it?” As Trump ups his rhetoric against Iran, and as the GCC crisis continues to roil, Japanese companies are trying to understand and replicate the ability of European multinationals to forge ahead and sign binding commercial agreements in Iran. On one hand, Japanese companies should be better suited than their European counterparts to crack-open the Iranian market. From a management perspective, Japanese multinationals benefit from tight coordination across sectors and secondarily, a close relationship with the relevant government ministries. The so-called keiretsu, or business groups, link together financial institutions, industrial giants, energy firms, and shipping companies into informal groups that commonly work together in domestic and international markets. Though keiretsu ties are now looser than in their 1990s heyday, bids for large infrastructure or industrial projects by Japanese multinationals are often enhanced by the provision of financing by the main keiretsu bank. At a time when Iran is starved for financing, and while European companies are struggling to enlist major banks for Iran investments, this historic coordination could put Japan in a highly competitive position. Japanese megabanks maintain significant non-dollar financial channels and Iran possesses significant yen-denominated reserves in Japan—proceeds from decades of oil sales. Yet, coordination is also a curse when the importance of coordination among companies is also reflected within decision-making processes. Japanese companies are managed on the basis of consensus. Approval for decisions is achieved through the process of nemawashi, by which support for an idea is achieved by gathering input and support from a wide range of internal stakeholders. This process both helps explain the impressive track record of Japanese companies in finding commercially successful strategies, but it is also a reflection of the high-degree of caution exercised by Japanese managers, who seek a wide consensus on any given strategy, rather than assume sole responsibility for risky decisions. Both the aversion to risk and the responsibility for risk pose an understandable barriers when comes to Iran investments. Multiply risk aversion across company departments, and then across the companies within a keiretsu group, and subsequently, the prospects for an Iran investment “green light” grow slim. The Japanese country managers responsible for business development in Iran have the unenviable task of seeking especially broad consensus for key decisions, likely involving a greater number of individuals than in a European corporate context. Consensus-building is further complicated by the fact that the political environment for Iran trade and investment seems to change on a near weekly basis. The longer the decision-making process, the more likely it will be that decision-makers will want to reevaluate in light of recent developments. Crucially, Japanese management teams are struggling to build consensus around new investments in Iran in part because of lack of political support. The largest Japanese enterprises are in regular communication with organizations such as the Ministry of Economy, Trade and Industry (METI), the Ministry of Foreign Affairs, and the Japanese External Trade Organization (JETRO). Each of these organizations boast staff with deep knowledge of the Iranian market and experience executing large agreements that is perhaps even deeper than among the equivalent European agencies. But Japan, unlike Europe, has yet to set an overarching policy regarding renewed economic ties in Iran, rendering this coordination with government inert. The lack of high-level political support remains the primary difference between the recent experiences of European and Japanese enterprises in Iran. Japanese Prime Minister Shinzo Abe was scheduled to travel to Iran in August 2016, only for the trip to be delayed over concerns that Japan’s first such visit since 1978 could sour possible ties with Donald Trump, who was growing resurgent in the U.S. presidential elections at the time. While Rouhani and Abe did meet on the sidelines of the United Nations General Assembly in October 2016, a high-level state visit to Iran is now on indefinite hold. Trump's eventual triumph saw Abe become among the first world leaders to visit the new president, in February of this year. While numerous European heads of state have traveled to Iran in the last two years, offering valuable political support to their engaged companies, Abe’s lack of a clear stance leaves Japanese companies exposed to possible reputational risks in the United States possibility even at the hands of Trump himself. Second, Japan’s government and Japanese companies are contending with political pressure from Saudi Arabia and the United Arab Emirates. 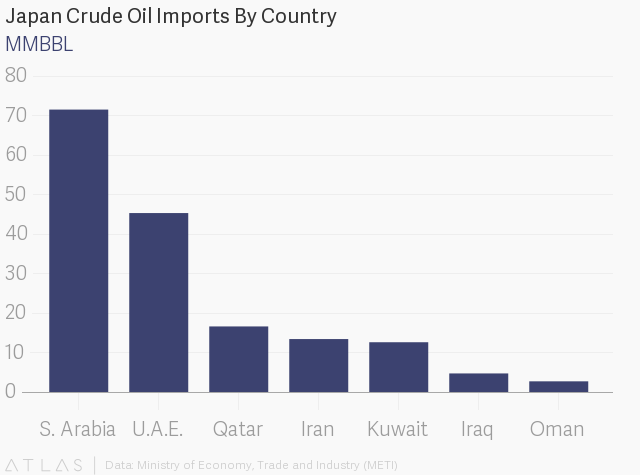 While Iran was Japan’s largest exporter of oil up until the tightening of international sanctions in 2012, Iranian oil imports were replaced by imports from Saudi Arabia and the United Arab Emirates. Recent data from the Petroleum Association of Japan shows Saudi and UAE oil accounting for a combined 70% of the country's imports. The governments of Saudi Arabia and the United Arab Emirates have used this energy dependence to send a clear message to Japanese companies regarding Iran: “It is us or them.” This pressure explains in part why Japan’s oil imports from Iran in 2017 are down 51% on the previous year. Japanese companies report being pressured not to invest in Iran, at the risk of losing major contracts in Saudi Arabia and UAE. European companies have also been subject to similar pressure from Saudi and Emirati authorities, but have been more effective in pushing back on false ultimatums. In a recent investor call, Total CFO Patrick de la Chevardiere disclosed that the company had informed its Saudi partners about its intention to sign a full agreement to develop Iran’s South Pars Gas field. Absent more direct political support, Japanese companies may remain frustrated in their attempts to engage Iran’s investment opportunities more aggressively. But there are a few strategies that could help create basic momentum behind investment plans while still mitigating risk. First, Japanese companies need to take the keiretsu mentality and use it to create consortia with European firms. European companies have already sought partnerships with Chinese financial and industrial partners to help spread the risk of projects in Iran. Japanese multinationals should more actively position themselves as possible partners for such arrangements, particularly given that Japanese companies already operate substantial business units or joint-ventures in Europe with many of the European companies engaged in Iran. Second, Japanese companies should be more creative in seeking ways to build credibility and stakeholder relationships in Iran. European companies, cognizant that significant investments would take a long time to move from initial discussions to binding contract, have used smaller projects to help demonstrate their commitment to the market while negotiations are ongoing. One compelling example can be seen in the case of French carmaker Renault, which has provided hardware and expertise to support the study of electric vehicles by students at Azad University. Japanese companies, which lead the world in many technologies, would be well-positioned to devise similar knowledge transfer projects in Iran. Such efforts who help build stakeholder relationships and also provide Japanese companies early examples of corporate social responsibility in Iran that can be used to help mitigate reputational risk. Japanese ambitions in Iran may remain constrained by politics for some time. But Japanese multinationals can and should remain committed to the market, seeking creative solutions to remain present and active. Ceding market share to European, Chinese, and Korean multinationals would prove a strategic blunder, particularly as cooperation remains a viable option. Jul 30 Is France Ready to Stand Up to Trump on Iran?